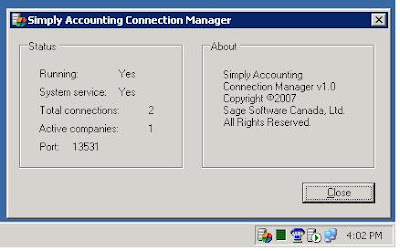 It may seem that Sage has taken a step backwards in their Simply Accounting setup for version 2008. Simply 2007 installed with no issues on Windows Vista with the data hosted on a network share. Simply 2008 on the other hand does not install as simply as that. The first problem was on the Windows Vista workstation. The little icon was in the System Tray, the service was installed and listed under services.msc, but it was not running. Once we did that, we hit the start button for the service and it started with no issues. But, we encountered the same error again! This client's data is located on a company share, so we were not sure what the next step was. Since this is a brand new install, we put in a call to Sage to see what they had to say. Well, apparently we need to do a "Data Only" install on the server. Once we did that, made sure the Simply Connection Manager service was started - it did not start up after the install - they were in business. There are two workstations connecting to this database. One of the two needs to be running as a restricted user. And we may be in a bit of a bind as the service is not wanting to start while logged in as the restricted user. We even set the service to run as admin via an elevated Windows Explorer and subsequent UAC elevation using a local admin rights user to access the "Run as Admin for All Users" properties. It is the end of the day for them, and for us, so we will work on it again in the morning to see if we need to set compatibility mode for the service in order to get it to run under a restricted account. But, so far we have struck out. 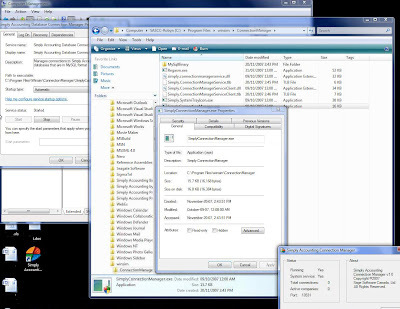 Be glad you're running a Windows file server... at least you can sort-of run the Connection Manager on your file server, those of us who have been using Samba on Linux for years with SA are now SOL with SA 2008 :-(. I'm with you on the fact that Sage has dropped the ball on this one. Perhaps watching how it installs on a Windows server can give you an idea of what could be done for Linux/Samba. As far as I can tell, it is some sort of MySQL setup that gets installed. This situation represents a huge hit for small clients who would have to look at installing a Windows based server. The only alternative that I can think of is a dedicated Simply file sharing Windows workstation that has the manager installed on it. Did you ever get this all figured out and fixed? Yes, we have Simply up and running on restricted workstations. As I recall, we needed to make sure the Connection Manager was up and running on the server and we needed to setup the Connection Manager to run as admin on the local machine. Once that was done, they were good to go.